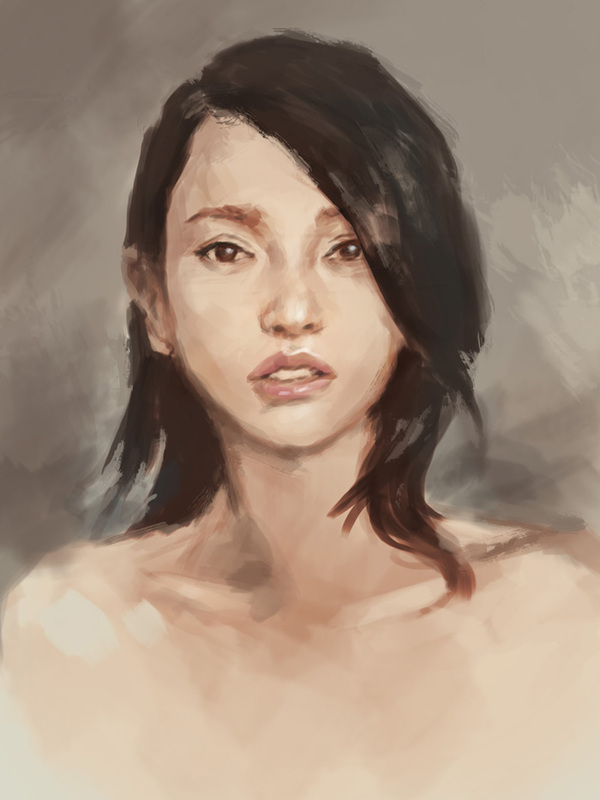 How to paint Asian woman face portrait study. Painting Asian woman portrait study. This video shows you a preview of how to paint female portrait in Photoshop. I just get this quick portrait study done this morning. First I thought I was going to do a quick 30 minutes warm up painting study, but then I got carried away. So I ended up spending a few hours on it. I mainly use just one brush (chalk brush from PS5). Then toward the end I want it to look more sketch and oil painting like so I spend a little more time playing around with custom brushes to get the edges I want. This digital painting is a study of an Asian (Chinese) woman portrait. A lot of you asked me why I don’t paint that many Asian or African or Arabian portrait. Well, it is because we hardly have any model in life session who are Asian. I mostly paint from life and since I live in North West of USA, most of the models we have are of the European descents. It is also a lot easier for me to paint them because I paint a lot of them. As for Asian portrait, it is a bit difficult for me since I have not done a lot. And I have to find a good reference to practice it with. They are basically the same but some of the lighting that effect features are different. I notice that I had to paint a lot lighter and less contrast when I paint this one. The lighting are still basically hit on the same feature, except they are less contrast because the eyes’ sockets are shallower and cute little nose does not cast that much shadow. Also a lot has to do with little changes in shapes of feature (nose, eyes, eyebrows location, etc. ), and most of them are very settle changes. Anyway here is a portrait of an Asian lady. Below are step by step how to draw and paint Asian woman portrait. Step 1, I start drawing an oval shape to construct a face. Within the frame of the head I establish eyes, nose, and mouth location within. If you want to know how to accurately place them go watch and follow the instruction at draw realistic face front view for in dept detail. Step 2, after I roughly sketch the mark up for eyes, nose, and mouth. Now I draw over the marked up spot. Step 3, I begin to shade some value in on some area like on the side of the nose bridge, under the eyes’ sockets, and on the tip of the nose. That is not how I work. I rarely zoom in. The reason being, you will get caught in detail and forget what you were doing with the overall image. Get it? You can zoom in after the whole image is done, to clean it up. You can do the same in Gimp and Sai. I use Photoshop. I can do it in PaintTool Sai, and what the program is it ? Hey, I love your tutorials they are very enlightening but I have a question: What brushes do you use?